Clothes in Greece were made out of three types of materials and the most frequently used material was wool. Women and men wore nearly the same kind of clothes and they were not shaped or fitted to the body, but were instead draped over it in soft folds. The colors used during this period were bright hued such as green, indigo, yellow, violet, dark red, and dark purple. The motifs used ranged from geometric designs like the dentil and arrangement of circles and squares to vegetable forms like the ivy, water leaf, and laurel. Let us see some of their clothes. This was a garment worn in the sixth century and was made up of wool, died indigo, madder, or saffron and was frequently patterned. The upper edges of this garment were folded over to hang down on the breast, then the garment was folded round the body and caught together on each shoulder by pins, leaving the arms uncovered. Despite the fact that it was open down the right side, it was held in place by the girdle, over which it was bloused. In places like Attica and Corinth, it was sewn together down the side below the waistline. As time passed, this garment grew wider and was known as the Doric chiton. The over-fold also deepened with time so that it was included in the girdling or hung over and concealed the girdle. When it was not girdled, the over-fold could be raised over the head, as a shawl. This garment was of Phoenician origin and was often seen as a female garment. It was made of thin wool, probably like crepe and similar materials that are still woven in Greece. It was cut with enough width from two pieces that were sewn together along the top of the extended arm. It was frequently pleated, long, and sometimes trailing. It was often sewn or caught together all the way down the right side with the left side left open. 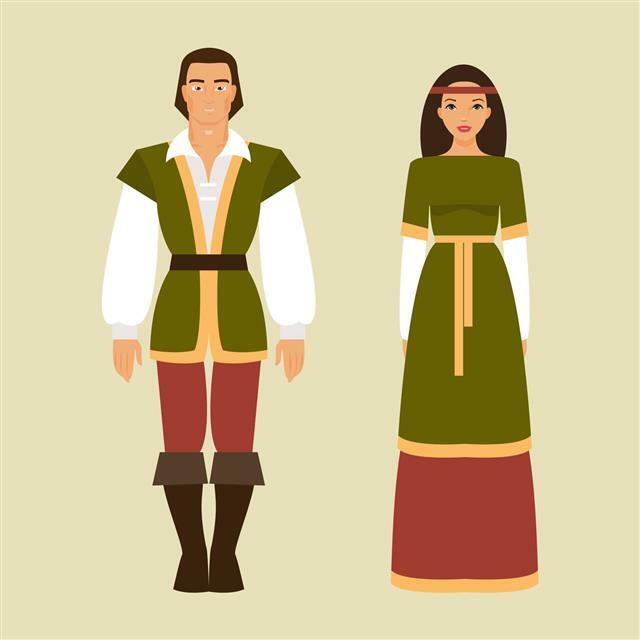 Men and women wore it in many ways. Most of the time, it was worn with a short wrap called the chalmydon. This is a rectangular piece of wool with weighted corners and is slung over the left shoulder, leaving the right arm free. Married women wore it with the corner of the head like a shawl. Older Dorian women wore it as their only garment. It also served as a blanket and was available in natural colors like white, brown, black, crimson, died scarlet and purple. Sometimes it had selvages, woven patterns, and embroidery. This term is used for a smaller woolen garment that was sometimes bordered and pinned at the right shoulder or the front. Younger, active men mostly wore it with a short chiton or alone. It was folded over and left hanging down across the top of the Doric chiton. Greek babies wore cloth diapers when it was hot, and during cold they were wrapped up in blankets. Most of the time children wore only cloth wrapped around their middles, resembling shorts.